ESSENDON is scouring the country to find another capable back-up ruckman as AFL clubs face an alarming shortage of ready-made big men. Club recruiters told the Herald Sun the lack of quality ruck prospects in this year’s draft was prompting scouts to look for more overseas talls such as Collingwood’s Mason Cox. The Bombers are looking to add another big man after Matthew Leuenberger’s surprise retirement last month. Essendon wanted to keep Leuenberger and offered him a new deal, but the former Lion hung up the boots after managing just two senior games in 2018. The Bombers have surged into fifth favourite ($9) for next year’s premiership with TAB after beating Hawthorn, Carlton and St Kilda for onball jet Dylan Shiel. Another tall would round out Essendon’s list as it chases its first finals win since 2004. But the Bombers could be looking for a needle in football’s haystack with clubs lamenting the small number of AFL-ready and top-class under-18 ruck prospects available. Remarkably, only three rucks were invited to the draft combine and one of them — Kieran Briggs — is zoned to Greater Western Sydney through its academy. This year’s leading ruck prospects from the state leagues include former Docker Zac Clarke (Subiaco), ex-Gold Coast Sun Keegan Brooksby (South Adelaide), Darcy Fort (Central Districts) and delisted Bulldog Tom Campbell. North Melbourne is also looking at a ruckman after losing Braydon Preuss to Melbourne, while GWS is looking to revive the career of Shane Mumford. Clarke was delisted by Fremantle at the end of 2017 with a knee injury, but the 28-year-old is tipped to secure an AFL lifeline after a strong comeback season in the WAFL. The 197cm Brooksby was named captain of the SANFL team of the year after playing 14 AFL games across three seasons with the struggling Suns. 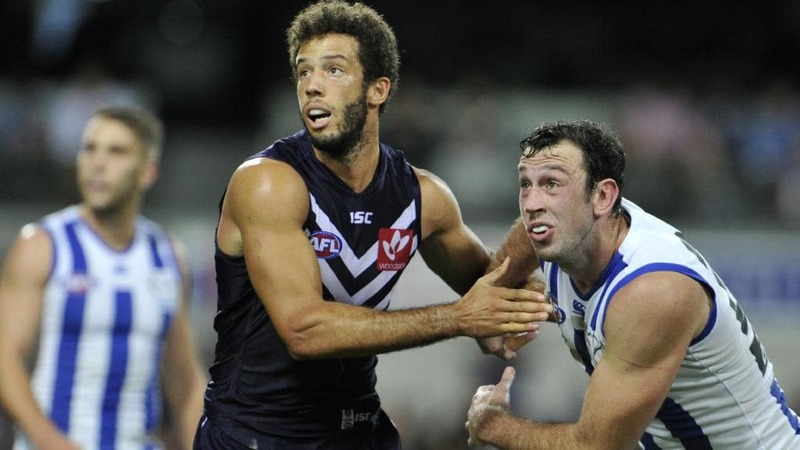 Delisted Docker Zac Clarke is a chance to return to an AFL list. The AFL has changed its ruck rules twice in recent seasons to help protect the influence of big men in the ruck contests including banning the third man up. The Bombers will enter the November 22-23 national draft with pick 34, but could also use one of their rookie draft selections to enlist another strong aerialist. Veteran big man Tom Bellchambers will lead Essendon’s ruck division in 2019, with versatile tall Shaun McKernan and former 203cm goalkeeper Sam Draper as back-up options. Bellchambers is coming off one of his best seasons, finishing sixth in the best-and-fairest from 20 matches, but his injury history means the club will ensure it has adequate coverage. The Bombers are excited by 203cm Draper’s potential coming into his third season, despite failing to make his AFL debut in his first two seasons in red and black. There’s generally one spot in the best 22 for a genuine ruck, so any decent young ruck who’s second in line will likely get a ruck spot at another team for minimal trade compensation, so there’s not a lot of incentive for clubs to invest in ruck talent unless their first ruck choice is in a very specific age bracket. Also, there are probably a decent number of guys who would have been ruckmen in the past who are just straight up key position players now. On top of which it appears to me that either AFL recruiters are exceptionally good at identifying ruck talent, and just don’t miss any, or that it’s very difficult for a ruckman to develop to AFL level in state league competitions. Is it 4 list spots or 5? If we’re going down this stop gap path, I think Fort is the way to go. Draper might not be far away and Clarke himself has had his own injury troubles which must be a concern. He looks to have got himself right this year but he’s got a long history prior to that. Maybe his body cannot handle AFL standard training loads? How much of the football he missed was due to simply not being picked versus injury? In his last 6 seasons he played a minimum 13 games at AFL level. Presumably there were times he was simply left out. So is his injury history overblown? Despite asking questions about this, i’d prefer to go with Fort as well. Not really sure what sunbury is referring too. So he’s played pretty much full seasons in 5 of the last 6 years. He missed all of 2017 with a knee. But that hasn’t been a chronic thing. Don’t all answer at once! How come whenever our draft picks are listed on a news site they always show only 3 picks and not 4? It’s hard to keep track with different categories of rookies and players getting upgraded to and downgraded from the senior list. So what’s the go with Lavender then? 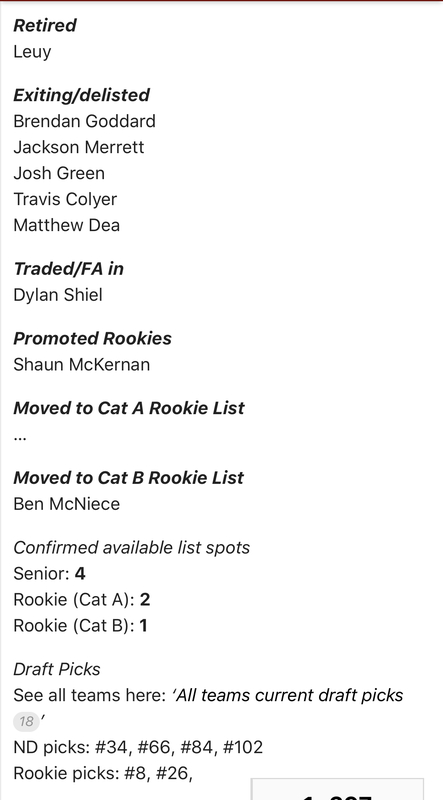 Wasn’t McNeice always a Cat B rookie? What happened there? okay thanks for clearly that up, wonder why he has been moved back to Cat B then?